Valentine’s Day is all about hearts and flowers. If you purchase a dozen red roses for your sweetie this Valentine’s Day, your beloved will enjoy them for about a week in the vase. If you purchase a rose bush, your darling will enjoy dozens of roses for perhaps twenty or more years. Red roses are the most common for this day. Consider, too, alternates with “gifted names” or roses with names that send a special message of love or forgiveness. Altissimo Climber, ever blooming, Zones 5-10. Blaze Climber, slight fragrance, ever blooming, Zones 5-10. Be Bop Shrub rose, repeat bloomer, Zones 5-10. Chrysler Imperial Hybrid Tea, very fragrant, Zones 6-10. Don Juan Climber, Shade Tolerant!, very fragrant, Zones 5-10. Fire Meidiland Landscape Rose, ever blooming, light fragrance, Zones 5-10. Kentucky Derby Hybrid Tea, light fragrance, Zones 6-10. Knockout Shrub Rose, light fragrance, Zones 5-10. Mr. Lincoln Hybrid Tea, Shade Tolerant!, very fragrant, Zones 5-10. Veteran’s Honor® Hybrid Tea, light fragrance, Zones 5-10. French Perfume™ Hybrid Tea, very fragrant, yellow shading to red, Zones 5-10. French Lace Floribunda Rose, fragrant, ivory, Zones 6-10. Hanky Panky Miniature Rose, fragrant, apricot, Zones 5-10. In The Mood Hybrid Tea, light fragrance, red, Zones 5-10. Just For You Miniature Rose, light fragrance, red, award winner. Lovesong™ Shrub Rose, fragrant, pale pink, Zones 5-10. Marry Me Miniature Rose, no fragrance, pink, Zones 5-10. Perpetually Yours™ Climbing English Legend Rose, fragrant, pale yellow, Zones 6-10. Pretty Lady® Floribunda Rose, white blushed pink, light fragrance, Zones 5-10. Remember Me® Hybrid Tea, bronze & burnt orange, very fragrant, Zones 5-10. Peace Hybrid Tea, yellow with pink shading, ever bloomer, Zones 5-10. 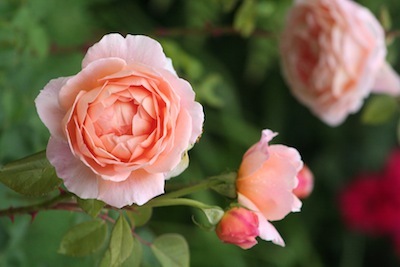 Reconciliation™ English Legend Rose, peach & buff, very fragrant, Zones 7-10. 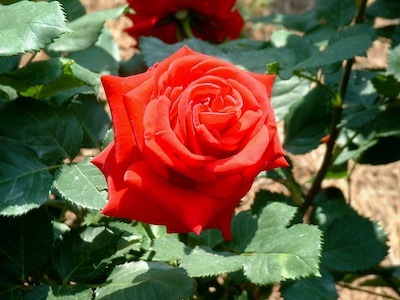 Note: Hybrid Tea roses bloom from late spring until first frost, usually one flower per stem. These are the classic florist or vase rose. Floribunda roses bloom in clusters with hybrid tea shaped blossoms. All roses benefit from deadheading (cutting off the spent flower heads.) Leave the last blooms in the fall to promote rose hips.